Arrive Delhi. 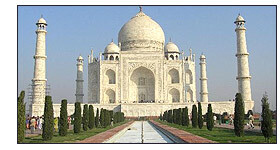 meet on arrival by Top Travels Rep. and drive to Agra (203 kms / 05 hrs). Checkin at hotel .O/N Agra. After breakfast free for shopping Lunch at hotel, In afternnon visit the world famous Taj Mahal and drive thru Agra Fort. After Dinner transfer to Tundla Railway station to connect train for Vns. (TAJ MAHAL IS CLOSED ON EVERY FRIDAY). Early morning drive 8 hours to Bodhgaya. Check-in at Hotel. Afternoon visit Mahabodhi Temple & Bodhi Tree, Great Buddha Statue, Niranjana River, Sujata Temple - which is across the Niranja River & it's 30 minutes walk through the paddy fields. 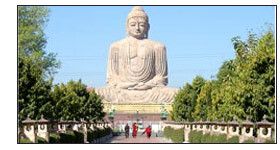 Also visit various other Buddhist Temples in Bodhgaya. Overnight at Htl in Bodhgaya. Early morning drive to Kushinagar with hot lunch on way. On arrival checkin at hotel. Dinner and overnight stay. Visit mahaparinirwana Temple (where Buddha took his last breathe) and Rambhar Stupa (cremation site of lord Buddha), Japan Temple. Afternoon drive 5 hrs to Lumbini (Nepal). While going to Lumbini, stop at India/Nepal border for Visa/Immigration formalities. Later check-in at Hotel. 15 Min. drive from the Nepal Border. Dinner and overnight at Htl. Noon visit Lumbini, the Birth place of Lord Buddha. Afternoon leave for Sravasti. On arrival checkin at hotel. Dinner and overnight at hotel in Sravasti. Arrive Delhi station then transfer to hotel. Morning free for shopping & own activities after Lunch at local restaurant then transfer to Airport to connect flight for onward destination.